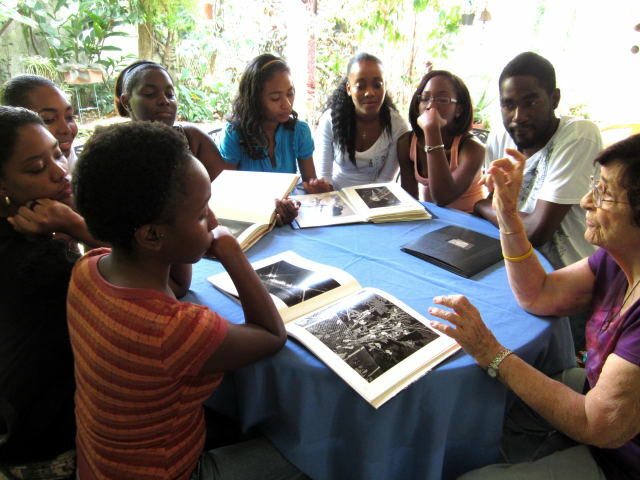 I carried eight of my third-year UTech students to the home of photographer Maria LaYacona in Kingston. Maria (as she insisted on being called) graciously opened up her house to us and shared her experiences of photographing in Jamaica for over fifty years. Among the snippets she shared included volunteering to photograph a new series of advertisements for the Gleaner newspaper, because at the time all the people in the ads were white and didn’t represent the typical Jamaican . She also contrasted the experience of photographing the founders of modern Jamaica – Sir Alexander Bustamante and Norman Washington Manley (2 days vs. 5 minutes). Maria continues to shoot film and develops her black and white film in her personal darkroom, which she showed to the students.